This Sweet Potato and Apple Bake recipe is screaming for the fall. It is a great treat during the holidays, or any time of the year, and has a feel of cool, crisp air with the sweet scent of cinnamon. 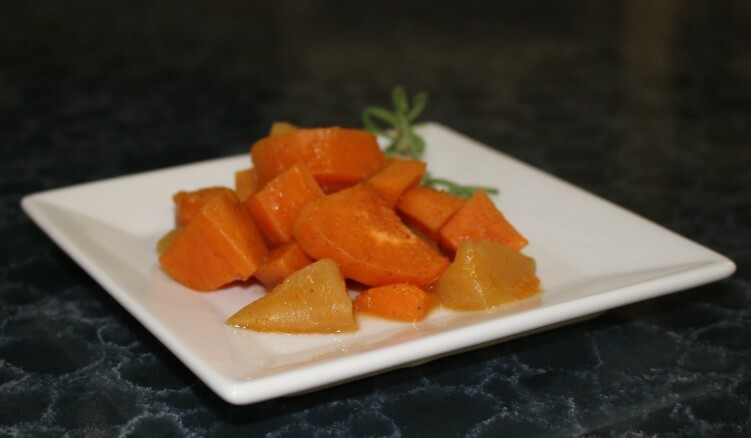 The natural sweetness of sweet potatoes and apples pair well with the flavors of coconut oil and the warm spices. It is a healthy spin on the various sweet potato casseroles often seen around the holidays, however this one you can enjoy without guilt. In a small bowl, mix the cinnamon, nutmeg, salt, and ginger together. In another small bowl melt the butter and coconut oil together, then add the maple syrup. Placed the diced sweet potatoes in a large zip top bag. Peel, core, and dice the apples and add them to the bag with the sweet potatoes. Pour the butter mix into the bag, zip, and toss around until all of the appels and sweet potatotes are covered evenly. Add ½ of the spices mixture, zip, toss, then add the second half. Make sure the apples and sweet potatoes are evenly covered with the butter mixture and the spice blend. Pour the mixture into a casserole dish and bake for 35-45 minutes, stirring once during the baking time.